I've acquired a tony nijhuis spit 72 electric. Lovely model however I'm unconcerned that the New Power XL-17hmb Servos in the ailerons look a bit on the light side. They are 3.5kg torque mini size. Would appreciate any advice on if they are up to the job before I take it up. I know some of the glider guys have to go down the slim fit servos route because of the wing build dimensions. But this spit is quite heavy and plenty of room. It's a shame to go to standard size servos because I'll have to cut a larger servo hole and build and paint a new servos cover to match. Let me know if you have any advice, my gut feeling is to bite the bullet and go bigger. A certain amount of care needs to be taken when selecting servos. I personally wouldn't have chosen servos of the type presently installed in the wing of the Spitfire, given the size and weight of it and the speed at which it's likely to fly. I don't think it's so much the torque output you need to consider, but also the robustness of the servo geartrain. Ultimately, these small servos are unlikely to be up to the job because of the wafer thin gears, and I rather fear that eventually the model might be lost as a consequence. Here you go, you can use this to calculate the servo torque, it's surprising how little torque is required. Years ago we would all fit Futaba 148s or 3003s to this type of model, with slightly less torque than these new modern mini servos. I would have gone with a standard size servo too if I was building this model. However, I would have no fears about using the minis if they were already in there. They will be fine for the flight loads on a plane such as this. You will however need to check them regularly, especially if you bump the surface on anything, they are not very tolerant of knocks as the gears are so small. Would it be less work to move up to a 26g park servo? These are tougher than the mini, but still much smaller than a standard? Too much hype about servos and servo power, put it into context, Brian Taylor with his similar size championship winning warbirds would use a single standard servo for the ailerons and it would have to drive the linkage. Also think about lifting say, 3.5kg and then think about applying that to a control surface, it is probably not too dissimilar to the pressure required to operate the controls on a full size Piper Super Cub or Pawnee at it's normal cruise speed. I wouldn't worry about the servo power from those servos. Ok cheers guys, thanks for your help. Andrew your comparison with a full size cub controls is very wrong. I don't think the comparison is wrong, it illustrates the point I was making. If you want to be pedantic then you need to consider the 72" Spitfire against the full size Cub flying at 80kts with much much bigger ailerons than the model and the gearing in the controls of the full size not just the relative moments etc. I was merely trying to illustrate a point rather than provide a technical or scientific answer. Anyway this is going off topic and I will leave it at that. 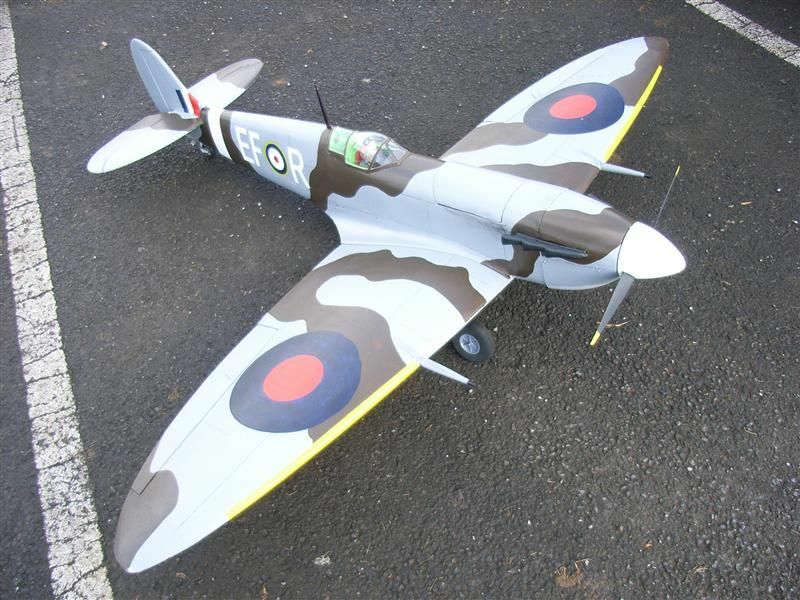 I perhaps used slightly over-kill servos on my version of the 72" TN Spitfire, I used the Hextronic HX5010 servos, mainly because I had some, ( 39g, 5.5Kg.cm). Andrew apologies if that came over a bit brusque. But. What point are you making? Your comparison seems like apples to oranges here. A full size cub (or otherwise) would have far more torque required when operating the controls vs a 6' model.